The New York Math Circle is a non-profit organization dedicated to enriching and supplementing Mathematical education in New York City. It seeks to stimulate the enjoyment, appreciation and knowledge of Mathematics through problem solving and guided discovery, both in our classes for students, and through courses for teachers. New York Math Circle’s goal is to constantly challenge your mind. You’ll get to solve unusual problems and invent your own, apply existing knowledge in new situations, learn famous gems of mathematics, and explore the unknown. The Math Circle will open your eyes and increase your sensitivity to all the mathematics around us. Our main requirement is that you have an open mind and a willingness to work. Math-M-Addicts is a selective, rigorous Saturday math enrichment program for 5th – 12th graders that focuses on creative problem solving. Students are introduced to advanced math topics in ways that build their critical, strategic, and logical thinking and communication skills. Math-M-Addicts is able to offer some of the most advanced math curriculum to middle and high school students available in NYC because the founders and many of the teachers themselves are former math Olympiad contestants and winners. Many of our alumni credit Math-M-Addicts as being the most rewarding and challenging learning experience of their academic lives. For some, MMA inspired them to pursue STEM majors in college and in their careers. 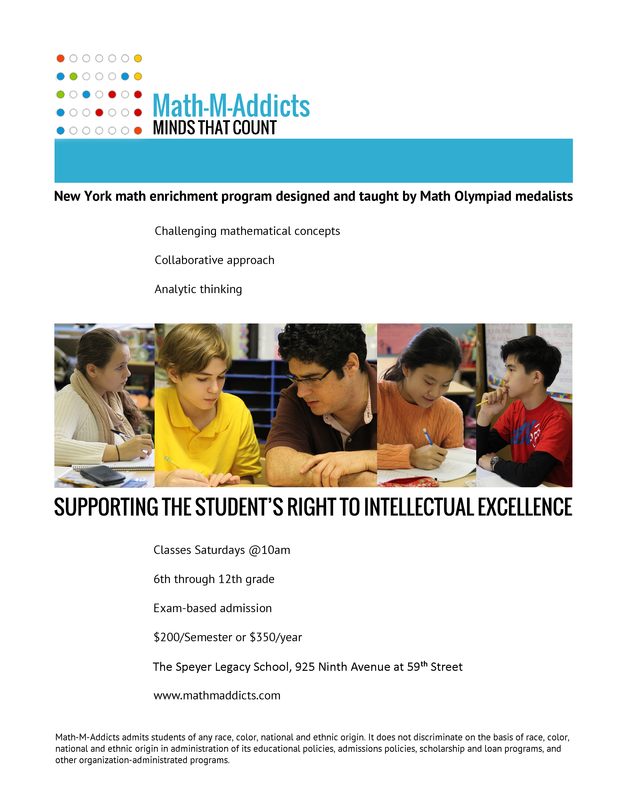 (For Math-M-Addicts) Classes are offered from 10-12 on Saturday mornings at Speyer Legacy School (59th st and 9th Ave). Classes are divided into four levels. Group A is our Olympiad level course for 9th to 12th graders. The program fee is $200 for one semester or $350 for the year. For any students who qualify for WIC or reduced lunch, free tuition + transportation is offered. Other students with financial need are also encouraged to apply for aid.